Bay Area Car Scene: Why Is Knowing How To Drive A Manual Important? Why Is Knowing How To Drive A Manual Important? In February an old man was held up at gun point while thieves tried to steal his Corvette. Shortly after the thieves found out the Corvette was manual however they realized they did not know how to drive it and simply decided to ditch the car and leave with his keys, wallet and phone. This is not the first time this has happened in the country, and it shows where our country has gone in terms of automotive skill. You see, America is the only country where cars with an automatic transmission drastically outweigh cars with a manual transmission. Now one would hope that perhaps this was due to the fast paced, traffic filled life most people deal with on a daily basis. The sad reality however is that many people simply don't know how to drive a manual transmission. Call me old fashioned but I believe part of having a drivers license should be the ability to drive a manual. Heck, even in some countries you have to take your drivers test in a manual! I specifically made sure my first car was a manual because it seemed ridiculous to not know how to drive one when I have my license. It is not that I feel everyone should be high revving and red lining their cars down the freeway every day but simply because there may be a point in time when you simply need to know how to drive a manual. Just imagine, you and your friends decide to go to a party and designate Tim as your designated driver. Tim just so happens to drive a manual, no big problem right? After all he is the designated driver and he will be the only person driving. Now lets say you get to the party and through some random turn of events he ends up plastered and you are the sober one? Guess this means you are the new designated driver and Tim hands you his keys accordingly. But there is a problem...you don't know how to drive a manual. So now what? You have to call around looking for a ride or call a taxi and when people say "why don't you just drive his car?" You get the benefit of saying "I don't know how!" This is one of the many scenarios that can be presented to you if you don't know how to drive a manual. 1. Economy cars are generally cheaper on Craigslist, think about it. With so many people not knowing how to drive a manual it means there isn't as much of a market for them, so that means price decreases! 2. Manual gives you more control. You know when you drive an automatic and you are on a hill and the car just slugs along until it finally downshifts? Well with a manual you can put it in a lower gear whenever you want to! 3. It just looks awesome to know how to drive a manual, seriously. Half the time I give people a ride the first thing they say upon entering my car is "you can drive a stick? Nice! I wish I knew how!" 4. Can't beat teaching someone to drive a manual as a fun first date! Just not so fun for your clutch! I do understand though that sometimes owning or driving a manual is a pain. The past few months I have been driving to San Francisco and back at least twice a day and on my manual transmission it can be a pain, especially on those steep hills San Francisco is so famous for. I will admit it has made me long for an automatic at times! An automatic is also good for stop and go traffic! I am not saying that everyone should go out and trade in their automatics for a manual, I do believe though that even if you never aim to own a manual car you should still learn how to drive one. Think of it as learning self defense, you pray you never have to use it but when you do have to use it you will be glad you made yourself learn! I too believe driving manual is something everyone should know how to do, and even though it drastically decreases the likelihood of your car getting stolen, I think people have a false sense of security from it. Any car can be stolen. And if the thief really wants to steal it, they'll find a way. My boyfriend currently owns an '05 Legacy 2.5 GT, it's a 5-speed manual. Guess what happened to it last year? It got stolen! This proves the point. Best security against a thief is a kill switch and or LoJack. And even then, it's not 100%. 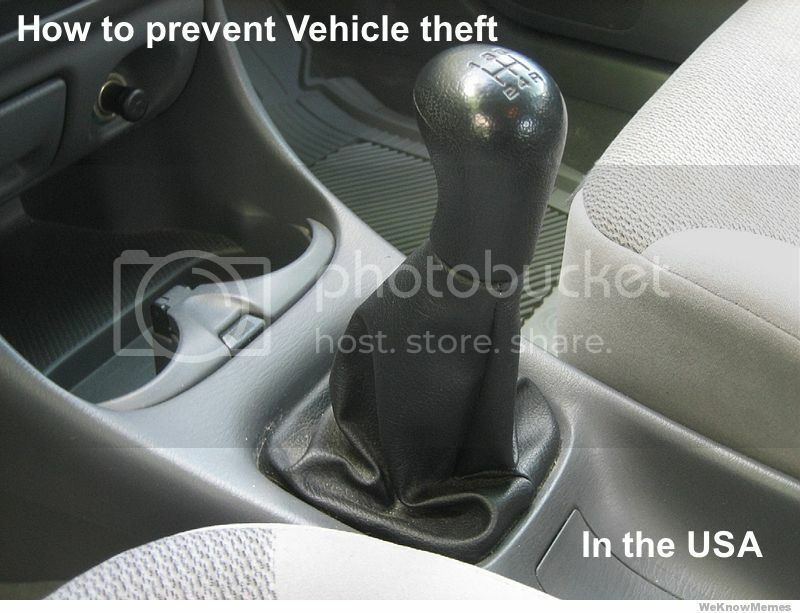 I agree, I didn't mention the part about the robber and the Corvette to say that owning a manual keeps your car safe. More that it is proof that manual cars are declining in the US as even some car jackers aren't skilld in driving them.